For other places with the same name, see Madang (disambiguation). Madang is a town in Madang Province on the north coast of Papua New Guinea. In 2005 it had a population of almost 30,000. The town is said to be one of the prettiest towns in the South Pacific. It is a pleasant and laid back town and likely the best place to begin your PNG visit. PMVs can get you to the highlands on a spectacular bit of highway and ferries can get you to Wewak. National airlines fly in and out of Madang on a regular schedule, including jet aircraft. There are many flying fox colonies in the town and the airport closes at 17.00 to avoid plane collisions with them at dusk. Airlines PNG has flights from Mt. Hagen and Wewak. By road, Madang can be reached from Lae, PNG's second city and from all the major Highlands centers. Boat Slow boat from/to Wewak or other destinations. Many "buses" (typically minivans or trucks where you sit in the back on a bench) connect to nearby towns. You can catch them at the central bus station near the market. Each vehicle has a number to indicate its destination. You can also flag down any passing vehicle with the right number. Vehicles are typically crowded. Passengers will be intrigued and interested if you join them this way if you're obviously visiting. There are many boats visiting its port, so there are likely options for water travel also. It is almost impossible to get around Madang township after 6:00pm. There are no taxis, and it is not advisable to walk around the town after dark. If you need to be somewhere else for dinner or drinks (apart from your hotel), make sure you pre-arrange a driver to take you there and pick you up. Therefore, plan to spend most evenings at your hotel / resort for dinner &/or drinks. For information when you arrive: Madang Visitor and Cultural Bureau, 852-3302 . Many visitors come to Madang for the fine Scuba diving available in nearby waters. Others to see a pretty, small, relatively safe PNG town that is a wonderful place to walk around and explore. The shoreline around the town has many small sandy swimming spots with grass, large trees and shade. It is a great town to relax and recuperate. Large stores have most amenities the traveler will need, as well as a lot of local items that are interesting to see and try. Local residents are curious but reserved around travelers, but are usually friendly and helpful when approached. Coastwatchers Memorial. 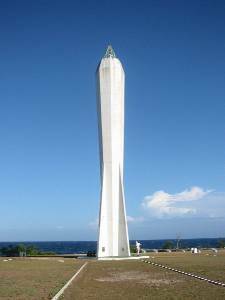 This is a working lighthouse on Madang Harbor. The coastwatchers were people, mainly Australian, who stayed in New Guinea after the Japanese invasion and, together with local helpers, reported on the movements of Japanese ships and planes, at great personal risk. In the center of Madang is a busy local market. People come daily from the PNG Highlands with produce to sell and load up with goods to take back with them at the end of the day. A wide variety of fruits and vegetables are available. Outside of Madang are many small villages. Many of these offer tours and will show you local customs and their way of life. The people are extremely friendly and a tour is highly recommended. Any of the hotels in town can organise this for you for approx US$25/person for an afternoon including all transport. Krangket Island is a short boat trip from Madang with boats leaving every half hour from the small boat terminal. The trip takes 5 mins and costs 2 kina. Two picturesque villages are located on the island with nice hedges and gardens. There are no roads on Krangket. Accommodation is also available on the island (Krangket Lodge) for 80 kina per night. North Coast There is an old WWII Japanese airfield which is now pretty much completely covered by Jungle. There is a lot of old plane wreckage and bomb craters still scattered around the place, including a large reasonably well-preserved Mitsubishi 'Betty' Bomber. Also on the north coast are some very pretty little missionary stations, most with beautiful views and also a lot of WWII history. A tour is recommended. The cost is around US$40 for half a day out of the Madang Resort. Village Stays There are several villages near Madang that have guesthouses. Hobe Village and Haya Village offer 25 Kina/night stays. Contact the Madang Visitor and Cultural Bureau, 852-3302  for more information. For Hobe Village, which is a 30 minute minibus ride from Madang, contact Joel Laleg 7692-4039 or Rassol Laleg 7271-7987. A village stay includes birdwatching and Japanese hideouts from WWII. There isn't a lot to buy that you can take home with you. At least not typical tourist trinkets. In the villages they will offer you pottery to buy or local crafts. There is a local market open everyday except Sunday, but this sells mainly fruits and vegetables. Some people sell a few bags, necklaces, t-shirts etc. The Madang Resort and Madang Lodge also have their own onsite craft shops. These are probably the best places in town and are reasonably priced. There are not many restaurants outside of the few hotels who serve both guests and people passing by. The golf club serves meals and drinks though its weekday daytime hours can be limited. Some stores sell a limited selection of local 'fast' food. You may be able to find someone to sign you in as a guest to the members-only boat club that is a favorite of local business people and ex-pats. The usual cautions apply for visitors eating in developing countries. Places catering to tourists are clean, the food is fresh and the water safe to drink. Seafood and produce are plentiful. Fresh coconuts are easy to buy and provide a refreshing drink. Ask someone for help, and they'll quickly brandish a large knife seemingly from nowhere and expertly cut it open. Jais Aben Resort, ☎ +675 7248 0905, e-mail: jaisaben@global.net.pg. A half hour bus ride out of town. Take a local bus and walk a mile or so to the resort through rural PNG (at least in contrast to Madang!) to find a large low-key resort primarily catering to scuba enthusiasts and family groups. It has pleasant green and blue surroundings and plentiful waterfront views as well as a pool and several dining areas. (NOTE: as at June 2009 the Jais Aben dive shop has closed, however, they can arrange for the dive store at Madang Resort to pick you up from the jetty at Jais Aben). Krangket Lodge is located on the opposite side of Krangket island to the boat drop off and takes around half an hour to walk (ask someone in the village to show you the way). The 'lodge' is actually two bungalows situated away from the villages on the corner of the island. Each bungalow has three single beds. They are a pretty basic set up, however, do have water/electricity/cooking gas/cutlery/plates/cooking utensils. No food is available on the island so you need to bring it in from Madang. The bungalows have their own small private beach and look back towards Jais Arben and the mountains beyond. An experience. Lutheran Guesthouse. Located a short distance from the Madang Resort. Double rooms cost 88 Kina per night (including breakfast). Includes kitchen and laundry. Comfortable with great views from the back lawn. K88. The Madang Lodge. A short walk from the centre of town and is clean and comfortable. To save money, ask for the non-air-conditioned rooms which have two single beds each with a simple thin mattress on the wooden bunk and share showers and toilets. Madang Resort Hotel. Caters to scuba divers (who seemingly don't leave the resort, except by boat) with an on-site dive shop. A little further out on the main road are several hotels, many catering to both tourists and local business travelers. Malolo Plantation Lodge, e-mail: service@pngtours.com. 14 air conditioned rooms in a coconut plantation on the edge of the rain forest. 45mins north of Madang. This city travel guide to Madang is a usable article. It has information on how to get there and on restaurants and hotels. An adventurous person could use this article, but please feel free to improve it by editing the page. This travel guide page was last edited at 16:37, on 13 January 2019 by Wikivoyage user Traveler100bot. Based on work by Wikivoyage users DaGizza, Wrh2Bot, Matroc, YiFeiBot, Texugo, Delusion23, Inasbot, LtPowers and Globe-trotter and others.